Another India? The simple answer is, yes. Or, at any rate, the emergence of another India is not at all unlikely; in fact, there are signs aplenty of its advent. What is more debatable is what its exact ingredients or outlines might be. Even those who are supposedly in charge of the new narrative aren’t sure. At the crux of all these debates is one word: Hindu. And its varieties—Hinduism, Hindutva, Hindu nationalism, Hindu majoritarianism, and so on. 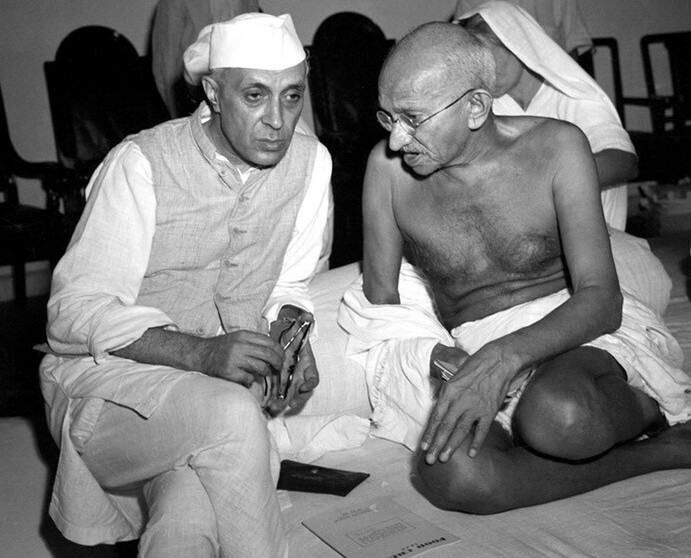 For many, especially those who were perpetrators of the older dominant, “secularist” plot, the rise of this new India spells doom, the end of the project that Gandhi-Nehru lead, and the Congress headed mostly by Nehru’s heirs brought to the present pass. Perhaps, they are right. It is the end of that kind of India, and of that kind of elite. Naturally, such people are unhappy; displaced privilege usually produces outrage if not predictions of doomsday. But we must examine the situation on its merits. The prospect of this new Hindu majoritarian India, has got a terribly hostile press. So much so that it seems as if there is a combined opposition media party, utterly hell-bent on demonising Hindu India and its protagonists. So inveterate is the antagonism displayed by this faction that sometimes it resembles visceral hatred, while at other pathetic self-delusion. Clutching at straws, seizing upon a Kanhaiya Kumar, Hardik Patel, or Jignesh Mevani as the youth icon, even avatar, to stop the BJP juggernaut in its tracks, this decimated opposition seems to be praying for nothing short of a miraculous slaying, metaphorically speaking, of the rakshasa called Narendra Modi. Funnily, this lot might never use such a Hindu metaphor in the first place. The modern sector is, perforce, doomed to express its outrage in a modern idiom. When they resort to tradition they end up making fools of themselves, wearing their janeu on their sleeve, so to speak. But all that is politics. Let’s leave it behind as we approach the end of year, even if by the Gregorian calendar. We Hindus follow multiple calendars, perhaps using each to our advantage. Why should we give up this opportunity to introspect, even meditate, over the future of our beloved country? The fact is that a Hindu majoritarian India may not be as bad as it is made out to be by its detractors. In fact, it may actually be a better, more wholesome, integrated, and compassionate India than the present state, that is so riven by uncivil strife. Hinduism, or dharma nationalism, may actually be a better guarantor of Indian pluralism than pseudo-secularism. If we are unprejudiced, fair-minded, and truly liberal, we should be willing to give the other side, especially when it is elected by an overwhelming majority, a fair chance rather than excoriating it before its commencement so as never to let it come into being. But in doing so, we shall fall prey to many fallacies, including considering a majoritarian nation and polity as the inherent opposite of liberalism and multiculturalism. Even in the latter, one element dominates, whether in the metaphor of melting pot, salad bowl, or mosaic. In liberal Western democracies, the dominant element is a combination of modernity and democracy, underwritten not only be science and technology, but by the culture of capitalism and consumerism. That a religious element, mostly Christian in the case of Europe, North America, and the Antipodes, endorses the national consensus is almost a given. Then why shouldn’t the Hindu cultural bedrock that informs the Indian consensus work as well as the Confucian or Shinto accord in modern China or Japan? True, this Hindu element should not thrust itself in everyone’s face or enforce its norms coercively. It should be the broadest, most open, most compassionate kind of Hindu unity. At the same time we must recognize where its most virulent opposition comes from. Not from other religious or ethnic minorities, but from the Hindu secularist elite, which does not wish to yield power. In other words, the problem with India at present is a life-and-death struggle between two elites, the erstwhile dominant secularist and the emergent Hindutva brigade. Who will win remains uncertain, though as of now, the latter seems ascendant. In the end, like all tussles for power, this one too may be more inconclusive than what appears right now. The cultural rule of the interpenetration of opposites predicts that the new order may not be radically different from the old. Of course, it would be rather disappointing if it were not at least slightly better—more confident, capable, competent, prosperous, creative, and egalitarian. » Prof Makarand R. Paranjape is a poet, author, and English Literature professor at Jawaharlal Nehru University, New Delhi. Bharatavarsha is encompassed from north to south by Sagarmatha, forehead of the ocean, a beautiful epithet for the tallest Himalayan peak, and Hind Mahasagar, the Indian Ocean. Famed as a divine creation, it is the bhumi of the Bharatas, hallowed by its sacred geography and the great souls who have guided her spiritual ascent and steered her civilizational destiny. Bharatavarsha literally means the continent (varsha) that is dedicated (rata) to light, wisdom (bha). Our Vedic Rishis devoted themselves to the quest for the eternal truth and ultimate reality, kevala jnana, satchidananda. The Bharatas were a venerable and ancient tribe mentioned in the Rig Veda, particularly in Mandala 3 of Bharata Rishi Vishwamitra. Mandala 7 says the Bharatas were on the victorious side in the Battle of the Ten Kings. There were three personifications of “Bharata” in Hindu tradition, one each in the first three yugas, or time cycles. Together they are regarded as the epitome of the civilisational values of the Sanatana Dharma. The first Bharata was born in the Satyuga as the son of Rshabdeva, first among recognized ancient sages. The Jaina community traces its spiritual lineage from Rshabhdeva, designated as the first Tirthankara; he is also known as Adinath, and synonymous with Siva, the foremost yogi of the Hindu tradition. Jinasena’s Adipurana says three great events occurred simultaneously in Jaina history: Rsabhdeva attained enlightenment and became the first Jina; the cakra (wheel) appeared in the armoury of his son Bharata and proclaimed him a cakravartin (emperor); and a son was born to Bharata, ensuring continuation of the Iksvaku dynasty founded by Rsabhdeva. Elaborating the multiple rebirths of father and son in the bhogabhumi (world of enjoyment) where salvation is not possible, the Adipurana explains their evolution to karmabhumi (world of karma) where the law of retribution operates and men follow different occupations (karman). Rsabhdeva created the Ksatriya, Vaisya, and Sudra castes; Bharata later created Brahmanas and appointed kings. The duty of the cakravartin is total conquest of all the directions (digvijaya) by means of superior moral and political powers, to unite the country under a single moral kingdom and prevent anarchy. Readers will note that the cakravartin is not merely an ideal ruler, but a powerful ancient political concept, inspired by a vision of the Hindu bhumi as a unity which was not belied by the presence of multiple centres of political power. That is why civilisational values permeated the whole land and gave the tradition its abiding continuity. As first cakravartin, Bharata, fasted, meditated, performed puja and followed the cakra symbolizing his kingship as it moved of its own accord to various parts of the country. He paused to perform pradaksina in Saurastra, where the Jina Aristanemi (cousin of Sri Krishna) would be born, all the while circling Ayodhya, centre of Aryavarta (land of the Arya, noble ones). Bharata thus subjugated rival kings and punished those who taxed their subjects excessively. His digvijaya was accomplished without violence, through innate capability, on account of punya (merit) acquired in previous lives through practice of Jaina precepts. He exemplified the virtues of compassion (daya), divine wisdom (Brahma-jñana) and penance (tapas). The second Bharata was born in the Tretayuga as the son of King Dasaratha of Ayodhya, and younger brother of Sri Rama. He embodied the virtues of love (prema), devotion (bhakti), and brotherhood (bandhutva). The story of the Ramayana is well-known, but briefly, Keikeyi, the second wife of King Dasaratha, schemes to have the heir apparent, Sri Rama, sent into exile for fourteen years, and her own son, Bharata, appointed crown prince in his place. Rama, accompanied by his brother Lakshman, and wife Sita, departs immediately and the grief-stricken Dasaratha passes away soon afterwards. Bharata, then on a visit to his maternal grandfather’s kingdom in Gandhara, returns only to learn of his father’s tragic demise and brother’s unfair exile. Tortured further by the thought that he could be considered complicit in this palace conspiracy, he decides—unswervingly—not to accept the throne. He then leads the people to the forest to persuade Rama to return. This political renunciation of a kingdom won illegitimately is a unique Hindu ethic. Bharata is regarded as the symbol of dharma and idealism, second only to Sri Rama. To this day, he is revered for his adherence to family values, truth, righteousness, filial love and duty. When Sri Rama refused to return to Ayodhya as rightful king, Bharata, at the intervention of Sita’s father, King Janaka, accepted the onerous duty of facilitating Rama to live righteously, i.e., in exile for fourteen years. He vowed to immolate himself if Rama did not return immediately at the end of the exile period and ascend his throne. Agreeing to govern Ayodhya only as regent, he placed Sri Rama’s sandals at the foot of the royal throne as the symbol of His kingship. The third Bharata was born in the Dwaparyuga as the son of Shakuntala and King Dushyant. Their story is part of the Mahabharata narrative, but it was Kalidasa who immortalized their love in Abhigyan Shakuntalam. Shakuntala was the daughter of Rishi Vishvamitra and the apsara Menaka, who was sent by Indra to distract the sage. Menaka returned to heaven, and her daughter was raised in the hermitage of Rishi Kanva. King Dushyant was the youngest son of King Puru, who had sacrificed his youth for his father, King Yayati. He founded the Paurava dynasty. Dushyant was hunting in the forest when, following a wounded deer into the hermitage of Rishi Kanva, he found Shakuntala nursing the animal. He fell in love and they married secretly in the Gandharva style, being their own witnesses. The king gave her a ring as token of his love and to establish her identity as his wife. Sadly, Shakuntala lost the ring and the king refused to accept her; she retired to the forest and gave birth to Bharata, who grew up so bold and fearless that he played with lions. Some years later, the ring was found and Dushyant brought Shakuntala and Bharat to Pratishthan, where Bharata later became king. Bharata is regarded as the greatest king of India, who lent his name to the country. He had nine sons, but deemed none of them fit to succeed him, and hence adopted a capable child as future ruler. Bharata personified the values of service (seva), valour (shaurya), and charity (dana). Thus the three Bharatas (two kings, one prince) seamlessly united the Satayuga, Tretayuga and Dwaparayuga and the land itself in political and cultural unity. They exemplified three ideals each that permeated Hindu civilisation and form its core values to this day. Rsabhdeva’s son Bharata gave us daya, Brahma-jñana and tapas; Dasaratha’s son Bharata gave us prema, bhakti, and bandhutva; and Dushyanta-Shakuntala’s son Bharata gave us seva, shaurya and dana. Their sterling qualities raised a landmass to divine bhumi—Bharat Mata, mother of the Bharata people. This explains the Hindu anguish and anger over M. F. Husain’s exceedingly vulgar imagery of the Eternal Mother. Hindus impart these nine values to every generation. The jeneu ceremony marking the transition from childhood to youth revolves around this value system. The youth bestowed the sacred thread takes nine vows; each vow is represented as a knot that binds the three separate strands of the jeneu. The jeneu was therefore a great privilege, bestowed upon conscious Hindus. Today Hindu gurus are extending its reach to all sections of society, shattering mindsets and barriers, and raising the whole population to higher awareness about the responsibilities of religion and culture. All this should nail the lie—peddled incessantly by Western Abrahamic so-called scholars and a modern “caste” designated by some as Useful Indian Idiots—that India was not a nation until the British made it so; that Hindu dharma is not a religion but an assorted collection of “cults” (whatever that means) and beliefs of folk origin (whatever that means too—who’s going to ask, anyway?). We have only to look at ourselves as our Vedic Rishis and Gurus did—as children of the Himalayas, the Ganga, Yamuna, Narmada, Krishna, Godavari, down to Kanyakumari. According to the distinguished scholar, Prof. Lokesh Chandra, the eternal significance of Adi Sankara is that in establishing mathams in the four corners of India, he also established the sacred geography of the four directions and united the country in common pilgrimage and cohesive culture at a time of grave danger. As we look back, some things startle the mind. The ancient seers travelled extraordinary distances, covering every nook and corner of the country and every community howsoever remote, and uniting them in a complex religious and cultural matrix that endures to this day. But more extraordinary is the fact that the ancient world seems to have had singular communicative skills. In the absence of what is called a common language (read English), a villager from Kerala could traverse the land and dominate the civilisation for over a thousand years, Marathi poets from the Deccan could settle in Punjab, a Guru from Punjab could reach Karnataka and Patna, one born in Gujarat could dominate north India. No one felt alien, or homeless, or misunderstood. This is surely one of the most enduring mysteries of the Sanatana Dharma. » Sandhya Jain is a writer of political and contemporary affairs and writes a fortnightly column for The Pioneer, New Delhi. She edits an opinions forum at Vijayvaani.